Their name is everywhere. America’s wealthiest industrial family by far and a vast financial power, the Du Ponts, from their mansions in northern Delaware’s “Chateau Country,” have long been leaders in the relentless drive to turn the United States into a plutocracy. The Du Pont story in this country began in 1800. Éleuthère Irénée du Pont, official keeper of the gunpowder of corrupt King Louis XVI, fled from revolutionary France to America. Two years later he founded the gunpowder company that called itself “America’s armorer”—and that President Wilson’s secretary of war called a “species of outlaws” for war profiteering. 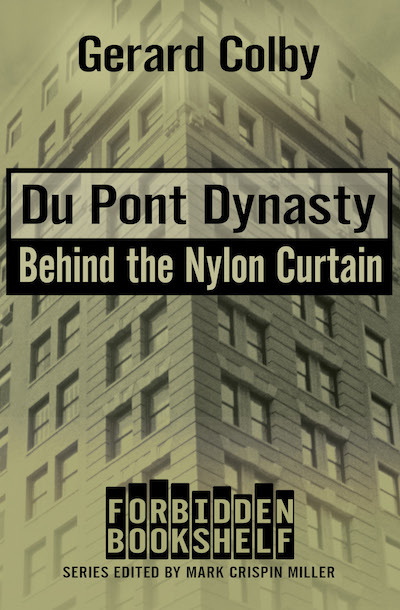 Du Pont Dynasty introduces many colorful characters, including “General” Henry du Pont, who profited from the Civil War to build the Gunpowder Trust, one of the first corporate monopolies; Alfred I. du Pont, betrayed by his cousins and pushed out of the organization, landing in social exile as the powerful “Count of Florida”; the three brothers who expanded Du Pont’s control to General Motors, fought autoworkers’ right to unionize, and then launched a family tradition of waging campaigns to destroy FDR’s New Deal regulatory reforms; Governor Pete du Pont, who ran for president and backed Newt Gingrich’s 1994 Republican Revolution; and Irving S. Shapiro, the architect of Du Pont’s ongoing campaign to undermine effective environmental regulation. From plans to force President Roosevelt from office, to munitions sales to warlords and the rising Nazis, to Freon’s damage to the planet’s life-protecting ozone layer, to the manufacture of deadly gases and the covered-up poisoning of Du Pont workers, to the reputation the company earned for being the worst polluter of America’s air and water, the Du Pont reign has been dappled with scandal for centuries. Culled from years of painstaking research and interviews, this fully documented book unfolds like a novel. Laying bare the bitter feuds, power plays, smokescreens, and careless unaccountability that erupted in murder, Colby pulls back the curtain on a dynasty whose formidable influence continues to this day. Suppressed in myriad ways and the subject of the author’s landmark federal lawsuit, Du Pont Dynasty is an essential history of the United States.